These records have been transcribed through the kind efforts of Dave Hargreave david.hargreave@wmich.edu . Dave has agreed to be a contact for any corrections and suggestions along with yours truly. 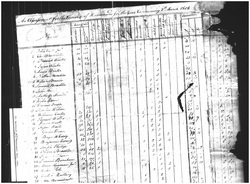 Please keep in mind, the Haldimand Census and Assessment records are the worst I've ever seen - the one to the left is a good and intact one! How Dave managed to ever get so much information out of them as he has ...... I do not know except through lots of thought and work! The Census and Assessment Files are being restructured. Below are developing pages that link to pages on this site - each page will have the census files displayed and the capacity to download the file in pdf or Exel Workbook formats.